Create a truly modern space with the amazing Glass Mosaica Blend Dusk mosaic tile. 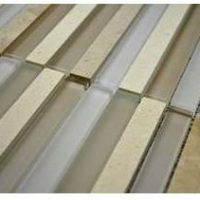 This very fashionable mosaic tile consists of a blend of glass and natural stone tiles in different shades of brown, white and grey and sports a glossy finish. The Glass Mosaica Blend Dusk mosaic tile is available in a standard size of 303x303mm and is sold per piece. This mosaic tile is as functional as it is good looking. It perfectly complements a range of neutral colours and its stunning looks make it perfect for a variety of applications – in decorative walls or for creating borders. 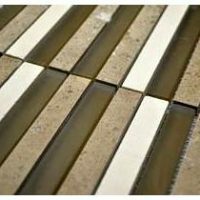 Thanks to special manufacturing, this tile can be installed with minimum grouting, which leads to a neat and modern finish. The Glass Mosaica Blend Dusk exhibits all the qualities of a superior grade product despite being affordably priced. It is manufactured to the best quality standards and features superior workmanship. It is designed to withstand the test of time and will look as good as new even years after installation. 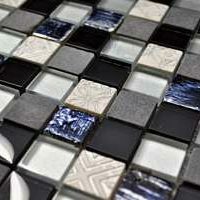 For modern mosaic tiles in Perth, consider the Glass Mosaica Blend Dusk tile. 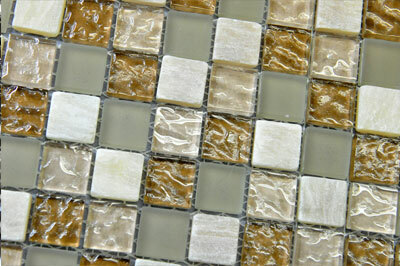 Buy this mosaic tile at an unmatched bargain from our online store today!